Recent bridge camera/superzoom releases such as the Fuji X-S1 might have suggested cameras sporting large, fixed lenses were evolving into luxury items second only to DSLRs. Blowing that theory is the Olympus SP-620UZ, which is resolutely a budget-priced, entry-level superzoom. Priced at £179.99 in the UK and $199.99 in the US, it is not much costlier than your average 5x zoom pocket model, yet sports a dual image stabilised 21x optical zoom plus 16 megapixel effective resolution from a 16.6MP 1/2.3-inch CCD sensor. The mini DSLR styling of the Olympus SP-620UZ means it's one for chunky jacket pockets only, but it is one of the smallest in its class. Dimensions are 109.7 x 74.3 x 73.7mm and it weighs a sturdy feeling 435g, largely just because it's powered by four alkaline AAs out of the box rather than a single rechargeable lithium ion cell. The equivalent 35mm focal range is 25-525mm, the lens jutting out roughly 2cm from its housing when at its widest setting. 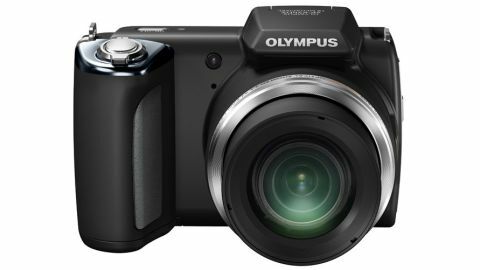 The Olympus SP-620UZ's available with a metallic silver or black body, and is aimed at beginners and travelling types rather than photo enthusiasts per se. The camera lacks the command dials, dedicated buttons and optical and electronic viewfinders (EVF) of pricier bridge cameras, such as the Fuji X and HS series models, Canon SX40 HS and new Nikon P510. There are few direct controls - there's not even a shooting mode dial or dedicated button - while users are reliant purely on the fixed, 3-inch, 230k dot resolution LCD for shot composition and review. It's fit for purpose though, with one of its closest matches for looks and features being Nikon's equally new Coolpix L810, also 16MP, and with a 22.5-585mm reach. More positively, the Olympus SP-620UZ comes with interesting features. These include a panorama mode that automatically stitches three successive images together, a 3D stills mode overlapping two differently angled stills for viewing on a 3D TV, plus Olympus' trademarked Magic Filters digital effects, most of which can be applied when capturing video as well as stills. So how does this budget superzoom actually perform?